Why not join the ultimate stylish Summer Sunday party. 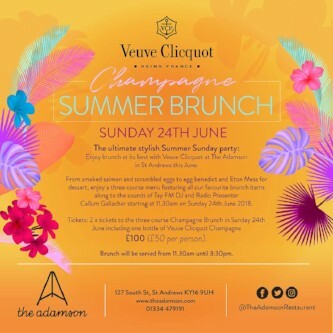 Enjoy brunch at its best with Veuve Clicquot at The Adamson on 24th June from 11:30am – 3:30pm. Choose from our three course menu of all our favorite brunch dishes including Smoked Salmon, Scrambled Eggs, Eggs Benedict and Eton mess, backed by the sounds of Tay FM DJ and Radio Presenter Callum Gallacher.